My AUCTION of early Magic: The Gathering Art has started! See my Auctions page for info. If you are looking for a special and unique art, this is where you will find it. 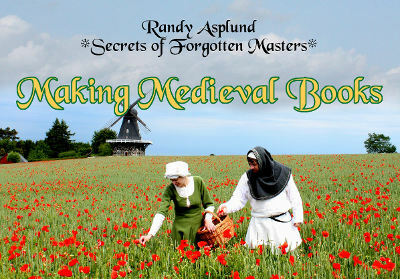 Randy is known internationally for his research and work making authentic style medieval illuminated manuscripts, whole medieval books, and his illustrations on MAGIC: The Gathering cards, Start Trek model kit covers, Magazines and Book covers, and TV. His clients have been many of the top companies in their markets. Are you looking for a gift for someone special, or for a handcrafted book for yourself? Randy will make your medieval art just as it was done in the Middle Ages, using the same authentic materials and techniques. Unlike other illuminators who use modern equivalents and copy existing art, Randy works as if he were actually an artist in the middle ages. He even makes many of his colors because they are so difficult to find today. Your art can be on genuine animal skin parchment, with ink made from wasp nests, genuine gold and silver leaf, and pigments made from such exotic materials as lapis lazuli, azurite, malachite, vermilion, minium, saffron, buckthorn berries, and brazil wood. And if you want your own book of any subject dear to you, he will bind it in wood boards and leather, with hand made clasps and other hardware, in your choice of styles as were done in Europe before 1500 AD. To learn more about the process and what Randy can do for you, please visit the galleries listed to the left. I am writing a very ambitious book about how medieval manuscript books were made. 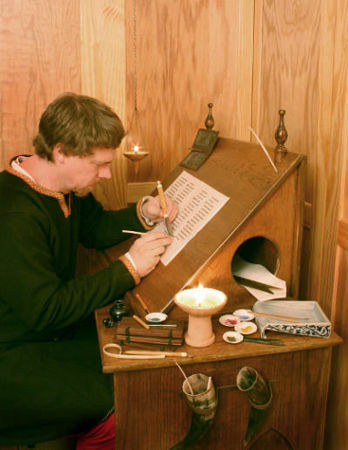 It is tentatively entitled Secrets Of Forgotten Masters: A 21st c. Artist's exploration of the technological processes used for making illuminated manuscript books from 700-1500 in Western Europe. I cover the tools. materials and techniques from making the raw hide into parchment pages, making colors from scratch, writing, gilding and all the way through tooling a fine binding. Take a look at my SoFM page here. You can also see a great sampling of what will be in that book if you take a look at my articles on how I make medieval books and pages. Secrets of Forgotten Masters is a work still in progress. This book is a recent collaboration between Randy and most of the other early Magic: The Gathering artists. Please click on the image to see details! Randy makes many kinds of art; so whether you like Science Fiction, Fantasy, or Contemporary art, please enjoy the links. Prints are available of many of Randy's works. To order prints, purchase originals, or commission new works, please see The Store page for details. -Enjoy! My artist friend Tom Baxa has released his book “Get Work as a Fantasy Artist” and I have written a contribution to it. Here is a link to a page on my web site about it. and Medieval Manuscript Illumination & Book Binding. Use the menu at left to visit pages. There's a lot to explore on this web site. From this page you will be able to explore the arts of making authentic Medieval Books and Manuscript Illumination, Fine art, Science Fiction and Fantasy art, Aviation art, and Model Aviation & Spacecraft. I even have a section devoted to pictures of what life was like in different times in history. You will also be introduced to my teaching services. I offer to teach lectures, workshops, and Power Point presentations on the various aspects of how medieval books were made.